In Far Cry 3, you adopt the role of an extreme sports enthusiast Jason Brody. Jason, his brothers and their friends are trapped on a Pacific island after an adventure holiday goes wrong. Jason’s friends are imprisoned by a sadistic pirate called Vas and the player must fight Vas and his forces to free his friends and escape from the island. The setting and story of Far Cry 3 aren’t revolutionary but the games design treats them in a way that is novel, humorous and refreshing. There is a lot of self-referential humor and lightheartedness mixed with an interesting sense of subversion. That’s not to say that Far Cry 3 doesn’t have its serious moments. Just when you think you’re in on the joke, the game takes a very dark turn and you find yourself surprised by the actions you compelled to commit through the story. Overall Far Cry 3 is an intelligent, self-referential and innovative game that takes place in a rich world with compelling characters. 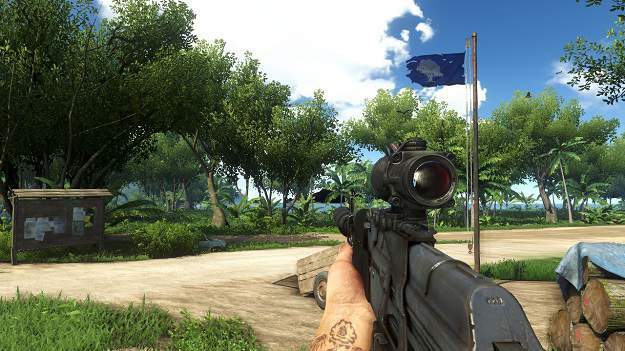 The core strength of Far Cry 3, and the reason it stands head and shoulders above other shooters of the same genre, is its open world environment. Rook Island, the setting, is an incredibly dense, beautiful and intriguing place to spend your time. The way that Far Cry 3 has been designed, the player doesn’t necessarily need to complete the main mission in order to explore the island. There are various side-missions that allow the player to explore all the different levels of the islands history at their leisure, from the ancient Chinese explorations to World War II Japanese occupation and current conflicts. Among the most satisfying and useful of these are the various hunting missions that the player must embark upon in order to upgrade their weapon capacity and abilities. There are dozens of different wildlife that populate the island and player must track each species down in turn, skin what they kill, and fashion the tools for their new life on the island. Navigation around the island is made possible through a series of sub games that involve unlocking various radio towers at different locations. These are a direct import from Ubisoft’s other hit series, the ‘Assassins Creed’ games. The towers can be unlocked in any order as the play advances through the story and make travel around the island quicker and easier. Some of these towers are incredibly finicky to climb and it may take numerous attempts in order to secure upgraded firearms, but the platter is rewarded through making the following missions easier. The open world of Far Cry 3 successfully evades the all too common tendency of first person shooters to feel as though the player is on a set path and play-thru set battles by the designs of the game. Look Island is yours to explore, and you can do so at a pace and in a way that suits your particular personality. Around 50% of the time in Far Cry Three the player is involved in battling Pirates to free Jason Brody’s friends. The player is free to embark upon some of these missions in their own style. This freedom to act in a stealth manner or to attack the enemies head-on is what gives the game its variability and contributes to its variety. Through multiple enemy outposts that the player must assault add to that story and moves forward the game. It’s up to the player to determine how Jason Brody will meet this challenge. He can act through stealth and subterfuge, and will be rewarded with extra points for not triggering alarms. Or he can charge right in and assault the parts directly. Far Cry 3, however, is not a stealth game. Many of the main missions require you to attack and destroy multiple enemies wave after wave with a traditional first person shooter style. 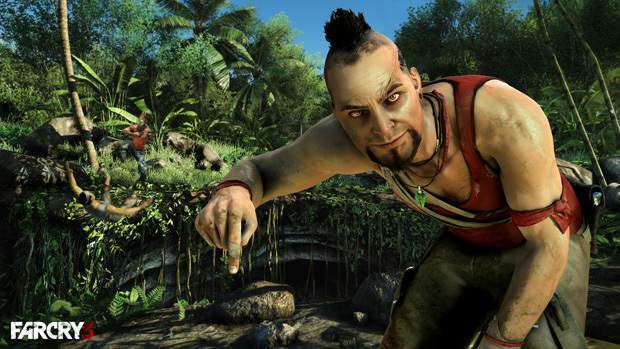 There are several different types of pirates in Far Cry 3. Each NPC responds in different ways towards Jason and will often take different strategies to kill him. Some charge directly at him and attempt to set him on fire while others walk slowly but are protected by heavily arms, and a third type will stroll back and try and shoot him from a distance. This is not to say that there isn’t a certain repetitiveness in the enemies you face in Far Cry 3. Of the several thousand pirates and mesenteries that will try and kill you, they roll exact copies of the same basic sprite. Well Far Cry 3, should be rewarded for the characterization and depth of riding in the enemies variation, there is still a long way to go before any sort of individuality is attained in these video games. Rook Island, isolated as it is at the junction of the Pacific and Indian oceans, is surprisingly well stocked with modern weaponry and remission. There are dozens of different types of handguns rifles rocket launches with injury including an amazing silent recover boat. Jason Brody has the opportunity to buy these at various stores or unlock them by completing the radio tower some games. The physics of these weapons work well enough and they have enough variability and variety to keep players interested through many hours of gameplay. The realism of the weapons may not be up to the standard of the AAA shooters such as Call of Duty or Battlefield, but they certainly have a charm all of their own and are perfectly usable for hour after hour of play. Unlike in the previous installment of the franchise, Far Cry 2, weapons do not degrade and break through heavy use. One common frustration, especially in the PC version of the game, is having to search the bodies of your fallen enemies without accidentally picking up a weapon. This is a small bug that consistently comes to frustrate on repeated playing and a game as polished as Far Cry 3 deserves better. Mainly because of the open world design and the ability to employ a variety of strategies to deal with the challenges Jason faces, the replayability of Far Cry 3 is very high. The game also offers the option to reset all the enemy bases once the player has completed the main story and gives them the opportunity to reconquer the fifty outposts with the new weapons and abilities that they have acquired over the main story. Like many modern games, Far Cry 3 has a variety of downloadable content sold at an extra charge to the original story. These are mainly extra side missions that allow the player to cause havoc and mayhem on a large scale once they have completed the main mission. They don’t add anything in particular to the game as it’s played and are mainly window dressing, available for a little extra money for those players who find themselves in need of an extra Far Cry 3 fix. The design of Far Cry 3 is where the game really shines. The environment has been so lovingly and artistically rendered that the player can get lost exploring the world and discovering new and interesting facets of the gameplay. 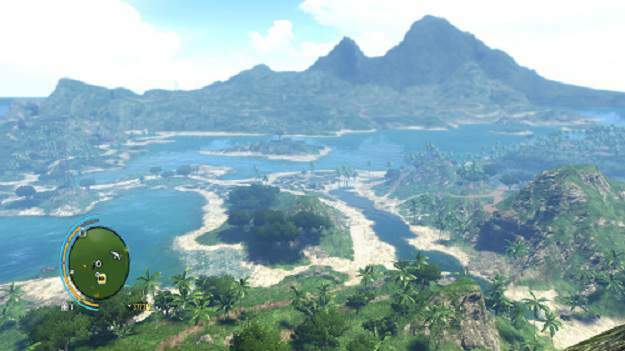 Most mountain locations in the game offer the player the opportunity to ride a hang glider around the island, dropping in on whatever gun battle, wild animal hunt, or location they find interesting. Later in the game you also acquire a squirrel suit that lets you glide from mountaintop to the surrounding low lands. This ability to take to the skies bestows an intoxicating sense of freedom and possibility that is sadly lacking in most open world games. The realism and constant danger of the world that Far Cry 3 designers have created make it incredibly impressive and a compelling place to spend your time, even if you’re not tracking down Jason Brody’s friends or completing the prescribed missions. The characters in Far Cry 3 are some of the best elements of the game, with the interesting exception of Jason Brody himself, the main character. For someone who you spend so much time inhabiting, Jason is a particularly vacuous and absent individual. This may be a comment by the games designers about the generic appeal of many first person shooter lead characters, but it does feel like a wasted opportunity when the person the player is controlling is so cliché and staid compared to the world they exist within. Whatever Jason Brody’s shortcomings, they are more than made up for by the overwhelmingly cinematic and compelling villains. Voss in particular, voiced with glee by Michael Mando, is a video game villain and a portrait of insanity that feels equal parts menacing and hilarious. His sister, Citra, whom the Rook Island natives worship as a goddess, is also a wonderfully entrancing and compellingly portrait. The best lines in the whole game belong to Buck, a crazed Australian who has ‘bought’ of Jason’s friends and requires certain objects to release him. He pushes the envelope about as far as possible for a video game villain, cracking jokes the whole time. 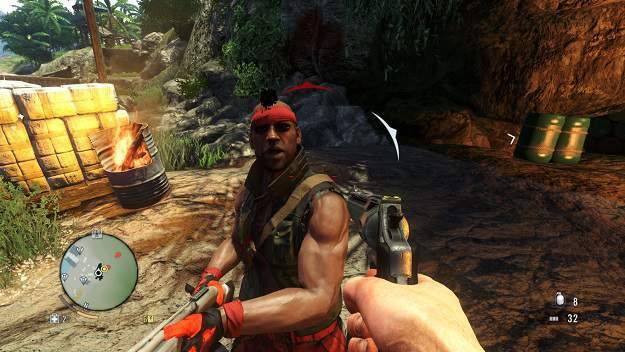 The plot and characters of Far Cry 3 are dense with references to video game tropes and clichés as well as numerous references to popular culture. This strange mixture of Irony, cliché and horror gives Far Cry 3 and distinctive blend of fun and darkness totally appropriate to a nightmare scenario unfolding in paradise.